The Gold Medallion-winning favorite---freshly revised! Renowned biblical Greek expert Mounce continues the Expositor's legacy of cutting-edge scholarship that affirms Scripture's divine authority. 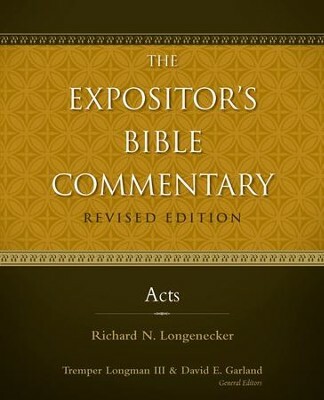 Volume 10 features the full NIV text of Luke, John, and Acts; comprehensive book introductions and outlines; passage-by-passage commentary; updated bibliographies; accessible language notes; Greek and Hebrew transliterations; balanced discussion of conflicting interpretations; and more. 1104 pages, hardcover from Zondervan. Richard N. Longenecker is Ramsey Armitage Professor of New Testament, Wycliffe College, University of Toronto. He receivec the B.A. and M.A. degrees from Wheaton College and Wheaton Graduate School of Theology, respectively, and the Ph.D. from New College, University of Edinburgh. His principal publications include Paul, Apostle of Liberty (1964), The Christology of Early Jewish Christianity (1970), The Ministry and Message of Paul (1971), Biblical Exegesis in the Apostolic Period (1975), The Acts of the Apostles in The Expositors Bible Commentary (1981), and The New Testament Social Ethics for Today (1984). I'm the author/artist and I want to review Acts / Revised - eBook.